Fedora has a strong following thanks to its Red Hat roots, and many desktop users will want to run this on their netbooks too. Unfortunately, nothing about the distribution has been optimised for netbook use and you certainly won't get out-of-the-box support for wireless on any of the machines we tried out of the box. Fonts appeared too large, and the UI generally felt cramped on the machines' 1024 x 600 screens. However, with a little work you can get help - here's a fix for the wireless on the MSI Wind, for example - and there are even kernel packages specifically for the Eee PC, which you can get here. However, brand loyalty aside, we wonder if this is making work for yourself for no reason. Unlike Ubuntu, there wasn't a wizard for getting the 3G dongle working so we where left to our own devices. OpenOffice was an obvious exclusion too, but Abiword was installed as standard. It doesn't take too long to install extra apps, though. Overall, we feel you would be better off using a netbook specific distribution. 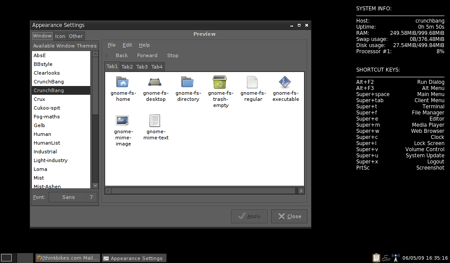 CrunchBang Linux is a lightweight Ubuntu-based distribution using the OpenBox window manager. CrunchEee is the same operating system, but optimised for the Eee PC, using a stripped down “lean” kernel designed for speed. Fonts have been optimised for the smaller screen, too, making for an excellent companion to the Eee PC. Based on Ubuntu 8.10, Crunch Eee's boot time is half that of a standard Ubuntu Intrepid install – so we can't wait to see what the team can do with Ubuntu Jaunty – which is already considerably faster at booting up. Once booted, it's a very simple affair, with just a grey and black colour scheme. Its simplicity is refreshing. The launch menu has no icons, but most of the applications you'll want are installed for you. Naturally, being Ubuntu based – installing more easy. 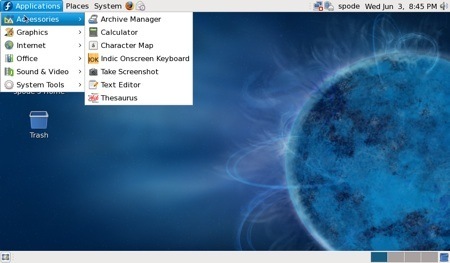 The same Eee PC tray utility that Eeebuntu provides is included here to allow you to turn off netbook hardware such as the webcam – something you'd usually need to go into the Bios to do. You can also over and underclock the CPU, allowing you to squeeze a little more battery power out of the machine, or speed up game play. Wireless works out of the box, as do 3G dongles. Despite the name, CrunchEee also worked flawlessly on our other netbooks.